An exceptional combination of convenient portability and cleaning prowess, the Motor Scrubber JET tackles heavy-duty deep cleaning from almost any angle. The easy-to-handle JET offers precision controlled cleaning chemical application, with cleaners delivered through the high-pressure pump directly to the scrubbing head. The JET''s onboard chemical injection system combined with interchangeable scrubbing brushes provides an incredible deep clean to break down dirt and grime clearing the way for sparkling fresh surfaces. The sealed-hub, high-torque JET motor provides 360rpm for impressive cleaning, washing, and polishing results with up to 4 hours run time on a single charge. The cordless JET has an adjustable soft rubber grip and lightweight forged-aluminum telescopic handle that can extend up to 10'' to access hard-to-reach areas to clean boats, motor vehicles, swimming pools, locker room showers, and more. The JET''s 1L chemical cleaning tank, battery, pump, and chemical cartridges are securely and neatly contained within the super comfortable backpack/harness which features padded shoulders and abdominal support. 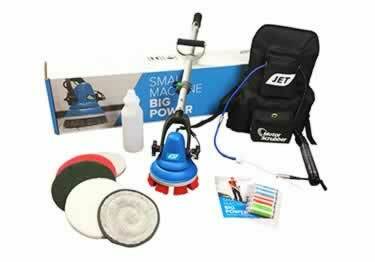 The JET Starter Kit includes everything you need to get cleaning: Medium duty brush, green scrubbing pad, red spray cleaning pad, white buffing pad, microfibre pad, melamine pad, pad holder, harness complete with battery, pump, and charger. MEDIUM DUTY BRUSH (MS1041) - Non-scratch versatile brush gives a brilliant clean on all internal smooth and textured floors and tiles. PAD HOLDER (MS1046) - Velcro drive plate for attaching all Jet pads. MICROFIBRE PAD (MS1053) - For glass, mirrors and stainless steel polishing. Also great for carpet spot cleaning. ESSENTIALS PAD RANGE - These pads are designed for use in chemical cleaning. Use for all types of hard flooring. BLACK (MS1060): For stripping floor polish; RED (MS1064): For polishing hard and wooden floors; WHITE (MS1066): For dry buffing hard floors. An exceptional combination of convenient portability and cleaning prowess, the Motor Scrubber JET tackles heavy-duty deep cleaning from almost any angle. The easy-to-handle JET offers precision controlled cleaning chemical application, with cleaners delivered through the high-pressure pump directly to the scrubbing head. Catch unwanted splashes under that cause odors, damage, & cross-contamination with Urinal Mat HD Absorbent with Grip Backing.